ALS. 2pp. Manor House, Kelmscott, Lechlade. Sept 4th [no year]. To [William] Woodall. 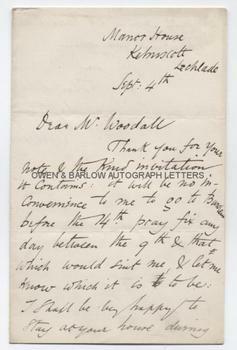 "Dear Mr. Woodall, Thank you for your note & the kind invitation it contains it will be no inconvenience to me to go to Burslem before the 14th. Pray fix any day between the 9th & that which would suit me, and let me know which it is to be. I shall be very happy to stay at your house during my brief sojourn at Burslem. Thanking you again. 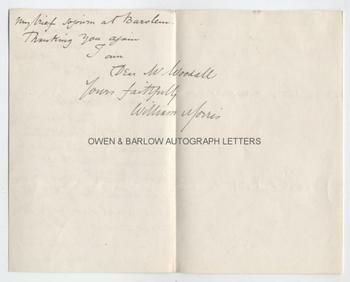 I am, Dear Mr. Woodall, Yours faithfully, William Morris". From the album of the radical Liberal M.P., William Woodall, who was also a trustee of the Wedgewood Institute. William Morris was one of those invited to the laying of the foundation stone by the Wedgewood Memorial Committee and was on other occasions asked to lecture to students at the Institute.